Developed by Ubisoft Montreal. Published by Ubisoft. Released April 29, 2014. Available on PC, PS3, PS4, Xbox 360, Xbox One (reviewed), Wii U. You know a game has nailed it in the presentation department when, two days after playing it, the very mention of its name evokes a vivid memory of its soundtrack and visual style. Child of Light is overwhelmingly stylish, with a simple but bold artistic direction, and a beautifully melodic soundtrack that digs into one's brain almost instantly. Child of Light is an innately memorable roleplaying game in almost every way, thanks to the aforementioned simplicity, which guides everything from gameplay to story. There is absolutely nothing too complicated about Ubisoft's latest foray into RPG territory, and that is by no means a bad thing. Players take on the role of Aurora, an Austrian princess who falls into a terminal sleep through potentially nefarious means. Awaking in a strange fantasy world, the princess finds out she has a special purpose, unites a cast of eccentric characters, and sets off to regain consciousness and save the day. The entire story is told in rhyme, with dialogue and exposition taking the form of convoluted poetry. It's a sweet little idea, though at times it feels just a touch too desperate in its attempts to work effectively. For the most part, Light's poetic exposition is relatively charming, though some of the self-aware jokes concerning it make me cringe in their repetition, obviousness, and patent lack of wit. The whole, "Character that doesn't know how to rhyme and gets called out on it," running gag was mildly amusing once, but gets dragged out with painful regularity. Nevertheless, Child of Light boasts a mildly mawkish, yet pleasant and easy to follow plot, filled with affable characters and set in an acceptably sugary world. Its smartly paced, and even manages to hit a few melancholy notes thanks to Aurora's pleasant relatability. 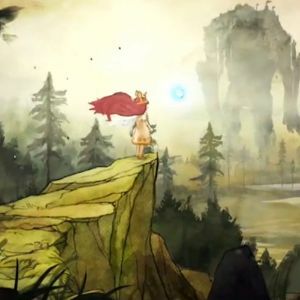 Child of Light is a sidescrolling RPG with a large focus on exploration. Early in the game, Aurora gains fairy wings, which give her pretty much free reign over the entire map - a map littered with hidden paths, secret treasure chests, and rare collectibles. Aurora is joined by a firefly companion, Igniculus, controlled via the right stick, who can help pick up objects, distract enemies, light dark pathways, and interact with various environmental hindrances. Much of the game is spent flitting around the world, using both sticks to control Aurora and Igniculus, as a beautifully stylized world unfolds before them. Of course, combat's a big part of the experience too, and this is where the game allows itself to get a little bit clever. Essentially built around the Active Time Battle system popularized by Final Fantasy, conflict involves Aurora and her growing cadre of friends facing off against various dark monsters, with both friend and foe sharing a single action timer. Each participant in the fight travels along this timer, which is split into a blue "waiting" phase, and a red "casting" phase. Using these phases to plot out moves, and learning to manipulate them, is key to winning fights. While in the blue section, the combatant does nothing, its icon gradually making its way to the red area. When the character first hits that red section, the player (or CPU) gets to make a command, selecting an attack or some other action. The icon then travels along the red phase, performing its action once it travels to the very end of the timer. Different actions have different casting times, with stronger attacks causing the character to travel along the timer at a slower pace. Even more crucially, should a character take damage while in the casting phase, it fails to perform and is shunted back into the wait phase. Combat thus becomes a game of cat and mouse, of outmaneuvering enemies by knowing when to strike and when to hold back. Allies can elect to "defend" rather than attack, spending their turn by getting to travel far more quickly along the timer on their next phase. By defending, players can avoid losing turns altogether, should a monster be ready to strike before they are. Holding back also allows players to better time their moves and interrupt the opponents. In addition, Igniculus can still be manipulated during battle, and if he is used to shine brightly on an enemy, he can slow down their action sequences tremendously, lending a further tactical edge. You can also heal with him, and pick up HP and MP orbs during the scrap.